By 2020, the world’s biggest potential solar markets will be found in the developing world, areas largely ignored by solar industry today, according to executives working to bring renewable energy to rural regions. Just 1 percent of the world’s solar panel production has been installed in developing countries, said Michael Eckhart, the president of the American Council on Renewable Energy, during a panel discussion Tuesday at the Solar Power International conference in Anaheim, Calif.
“This is a scandal for our industry and we must find solutions,” said Mr. Eckhart, who has worked on solar projects in Africa and India. The market in Africa, Asia and Latin America is potentially vast given that nearly 44 percent of the population of the developing world lacks access to electricity, according to Simon Rolland, a policy and development officer for the Alliance for Rural Electrification, based in Brussels. Therein lies a conundrum: Bringing solar energy to those communities means building and financing off-the-grid solar arrays in remote locations that use batteries to store the electricity generated by the photovoltaic panels. Amid the daily drumbeat of mass layoffs, here’s some sunny news: Solar startup Suniva cut the ribbon Thursday on a photovoltaic cell factory outside Atlanta. As solar factories go, Suniva’s plant – the first such facility in the Southeast – is relatively small, making 32 megawatts of solar cells annually until production is fully ramped up to 175 megawatts in 2010. But the factory will create 100 green collar jobs and it follows the opening of SolarWorld’s new solar cell fab outside Portland, Ore., that will produce 500 megawatts’ worth of solar cells, and thin-film solar startup HelioVolt’s factory in Austin. Meanwhile, Solyndra, a Silicon Valley thin-film solar startup, is expanding its production facilities while Bay Area rival OptiSolar is building a Sacramento factory that will employ 1,000 workers to produce solar cells for the power plant the company is building for utility PG&E (PCG). (Leading thin-film solar company First Solar (FSLR) operates a factory in Ohio as well as plants in Malaysia.) But Chinese solar giant Suntech (STP) last week said it has put plans for U.S. factories on hold due to the credit crunch. The Suniva grand opening comes on a good news-bad news day for the solar industry. On one hand, President-elect Barack Obama is expected to nominate alternative energy proponent and Nobel laureate Steven Chu, director of the Lawrence Berkeley National Laboratory, as Secretary of Energy. But the solar industry faces a tough year ahead. On Thursday, research firm New Energy Finance, echoing other analysts, predicted prices for polysilicon – the base material of conventional solar cells – would fall 30% in 2009. That’s bad news for conventional solar cell makers like SunPower (SPWRA) and Suntech if they’ve locked in silicon supplies at higher prices but provides an opening for further growth for thin-film solar companies that make solar cells that use little or no polysilicon. When Green Wombat met with SolarWorld COO Boris Klebensberger last month, he noted that the German solar cell maker opened for business in 1998 just as oil prices hit an all-time low. “The company was founded by five crazy guys who people thought were on drugs, ” he laughed. They still might. SolarWorld, now the world’s fifth-largest solar module manufacturer, has made an unsolicited $1.3 billion offer to buy General Motors’ German-based Opel division. And why would a renewable energy company want to get into a fossil fuel-dependent business? To build green cars, of course. If the Pope can go green, why not another tradition-bound global institution? If SolarWorld’s bid seems comically low for a century-old automotive powerhouse, consider this: As of Wednesday morning General Motors’ (GM) total market capitalization stood at $2.2 billion. That’s not a typo — Sergey Brin and Larry Page probably have that much rattling around the change drawers of their Priuses (TM). SolarWorld’s market cap, in contrast, is $1.6 billion. The SolarWorld bid does come with a rather large catch, however. The company wants GM to make compensation payments of 40,000 euros (about $51,500) per Opel worker for a total of 1 billion euros ($1.3 billion) — what the automaker would have to shell out under German law if it shut down. Opel has been something of a jewel in GM’s crown, but it has suffered from its parent’s mistakes and now Opel executives themselves are asking the German government for a billion-dollar bailout. 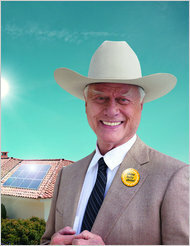 GM has dismissed the SolarWorld bid out of hand while some financial analysts called the offer a PR stunt. If it was a joke, it’s been a costly one: the company’s shares initially plunged 19% after Jefferies questioned management’s credibility and downgraded its stock. While SolarWorld has no plans to make a sun-powered car like the experimental racer (pictured above) it built, Asbeck says the company would retool Opel to increase production of green cars by 5% each year, transitioning from plug-in electric hybrids like the Chevy Volt to all-electric vehicles. “We think extended range cars are the car for the next five years,” he says, noting that Opel management would be left in place but given a new mission. SolarWorld’s chances of acquiring Opel might appear slim, but Asbeck’s strategy is sober. Just witness Silicon Valley startup Better Place’s success at signing deals with the governments of Israel, Denmark, Australia and California to build an electric car infrastructure and its alliance with Renault-Nissan to produce battery-powered vehicles. Even Ford (F) executive chairman Bill Ford has been developing a green strategy for the auto industry, according to The New York Times. HILLSBORO, Ore. – A solar cell factory has sprouted in Oregon’s Silicon Forest amid the region’s old-growth semiconductor plants. And who is providing these well-paid, high-tech green jobs, investing in America rather than fleeing to Asia to set up shop? The Germans. “I know a lot of people will say, ‘You idiot, Boris. You can’t manufacture in the U.S.,’ ” says Klebensberger, 39, who sports a hoop earring and has a penchant for saying what’s on his mind. That has been the conventional wisdom. 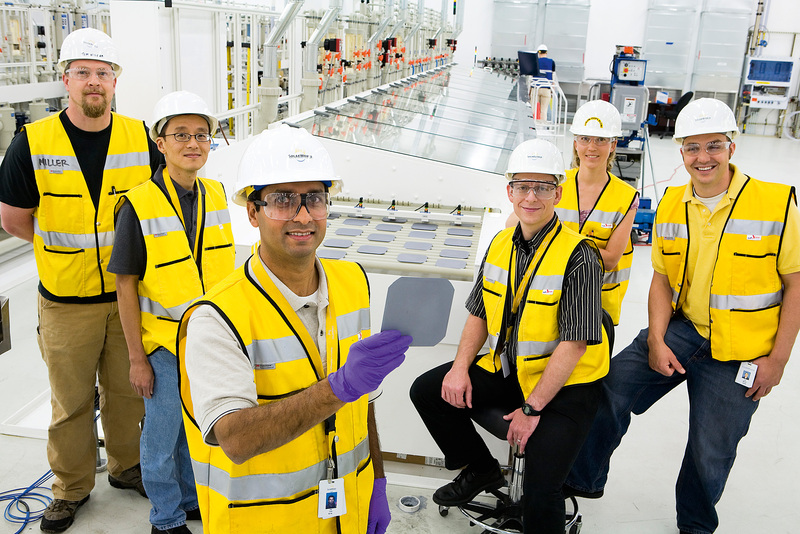 While thin-film solar companies like First Solar (FSLR), Solyndra and Energy Conversion Devices (ENER) have built factories in the U.S., traditional silicon-based module makers such as SunPower (SPWRA) have outsourced production overseas. 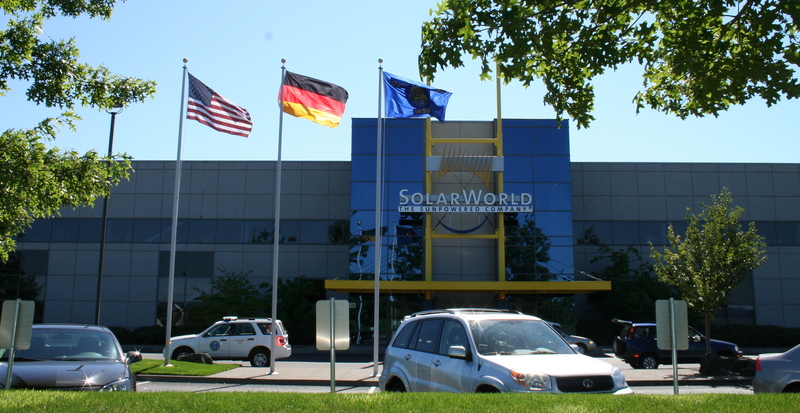 SolarWorld jumped into the U.S. market in 2006 when it acquired Royal Dutch Shell’s solar cell factory in Camarillo, Calif., and a silicon ingot plant in Vancouver, Wash. “This was an opportunity for SolarWorld to establish itself in the U.S. market very quickly and get an employee base,” says Klebensberger, who also serves as COO of SolarWorld’s global operations. The company was founded in 1998 by, as Klebensberger puts it, “five crazy guys who people thought were on drugs” when they said they were going into the solar business. (Klebensberger was employee No. 7.) But Germany’s lucrative incentives for renewable energy quickly turned the nation into a solar powerhouse and SolarWorld went public in 1999. Revenues – $931 million last year – have been growing around 30%-40% annually and the company has a market cap of $3.1 billion. SolarWorld saw a potentially huge opportunity in the U.S. but the Shell plant was relatively small – producing 80 megawatts of solar cells annually – so Klebensberger went shopping for a new factory. He ruled out California – too expensive – before settling on Hillsboro, 20 miles west of Portland. The retrofit took about 15 months – though the minimalist gray industrial decor of the Komatsu era remains. When fully built out in a couple of years, the plant will produce 500 megawatts’ worth of solar cells annually and employ 1,400 workers. In the meantime, the target is 100 megawatts by the end of 2008, and 250 megawatts in 2009. In one corner of the building, a room of steel vats cook up polysilicon, producing eight-foot-long silicon ingots in the shape of giant silver pencils. Those ingots are taken to another room where wiresaw machines slice them into wafers. The wafers then travel down a conveyor belt where robots wash them and scan for imperfections. In an adjoining room, the wafers are imprinted with contacts and transformed into photovoltaic cells. Depending on customer demand, SolarWorld will sell both silicon wafers and finished cells. The company currently gets 10% to 15% of its revenues from the U.S.
SolarWorld isn’t the only solar company wanting a made-in-America label. Sanyo this week announced it will build a solar cell factory in Salem, south of Portland. And Chinese solar giant Suntech (STP) earlier this month acquired a California-based solar installer and announced a joint venture with San Francisco-based MMA Renewable Ventures (MMA) to build solar power plants. Suntech chief strategy officer Steven Chan told Green Wombat this week that Suntech will likely open factories in the U.S. within a couple years.